This chart comes from our analysis of Microsoft Exchange Reviewed Solutions Program (ESRP) v3 (Exchange 2010) performance results for the over 5000 mailbox category, a report sent out to SCI Storage Intelligence Newsletter subscribers last month. The total database backup throughput reported here is calculated based on the MB read per second per database times the number of databases in a storage configuration. ESRP currently reports two metrics for database backups the first used in our calculation above is the backup throughput on a database basis and the second is backup throughput on a server basis. I find neither of these that useful from a storage system perspective so we have calculated a new metric for our ESRP analysis which represents the total Exchange database backup per storage system. 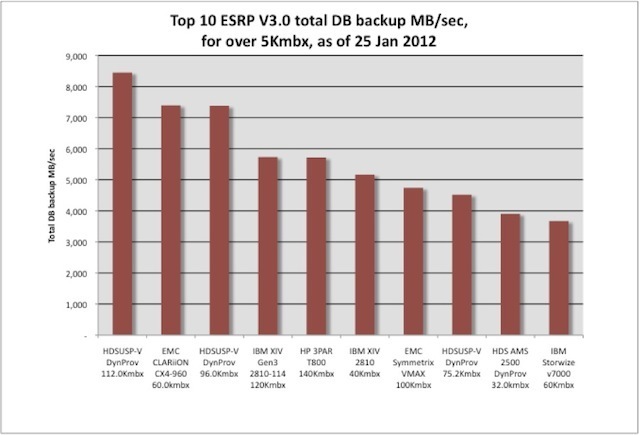 I find three submissions (#1, #3 & #8 above) for the same storage system (HDS USP-V) somewhat unusual in any top 10 chart and as such, provides a unique opportunity to understand how to optimize storage for Exchange 2010. For example, the first thing I noticed when looking at the details behind the above chart is that disk speed doesn’t speed up database throughput. The #1, #3 and #8 submissions above (HDS USP-V using Dynamic or thin provisioning) had 7200rpm, 15Krpm and 7200rpm disks respectively with 512 disk each. If I had to guess, the reason the HDS USP-V system with faster disks didn’t backup as well as the #1 system is that its mailbox databases spanned multiple physical disks. For instance, in the case of the (#3) 15Krpm/600GB FC disk system it took at least 3 disks to hold a 1.5TB mailbox database. For the #1 performing 7200rpm/2TB SATA disk system, a single disk could hold almost 4-583GB databases on a single disk. The slowest performer (#8) also with 7200rpm/2TB SATA disks could hold at most 1-1.2TB mailbox database per disk. One other thing that might be a factor between the #1 and #3 submissions is that the data being backed up per host was significantly different. Specifically for a host in the #1 HDS USP-V solution they only backed up ~4TB but for a host in the #3 submission they had to backup ~9TB. However, this doesn’t help explain the #8 solution, which only had to backup 5.5TB per host. Probably something else I might be missing here but I believe a detailed study of these three HDS USP-V systems ESRP performance would illustrate some principles on how to accelerate Exchange storage performance. I suppose the obvious points to come away with here are to keep your Exchange databases smaller than your physical disk sizes and don’t overburden your Exchange servers. The full ESRP performance report went out to our newsletter subscriber’s this past January. A copy of the full report will be up on the dispatches page of our website sometime next month (if all goes well). However, you can get the full ESRP performance analysis now and subscribe to future newsletters by just sending us an email or using the signup form above right. For a more extensive discussion of block or SAN storage performance covering SPC-1&-2 (top 30) and ESRP (top 20) results please consider purchasing SCI’s SAN Storage Buying Guide available on our website. As always, we welcome any suggestions on how to improve our analysis of ESRP results or any of our other storage performance analyses.